The monthly jobs report is more than just one number. The report is created using two data sets, seasonally adjusting the data, and reporting the data. Sometime job gains, or worker gains, are recorded lower and reported higher than the headline number. Sometime the data is recorded higher and reported lower. The seasonal factors change month to month, season to season, and year to year. 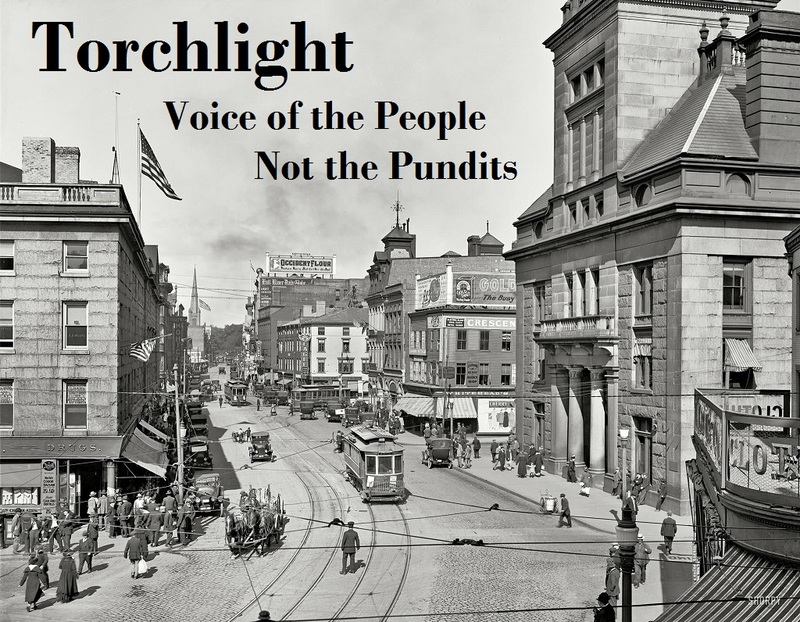 This report was Stellar. There are some things that you may not hear elsewhere. We should have seen non-seasonally adjusted workers grow, or contract, by 0.10%. The seasonal factors used to convert the recorded non-seasonally data to the reported seasonally adjusted data could be high or low. The uncertainty of the growth and the seasonal factors was likened to throwing darts. 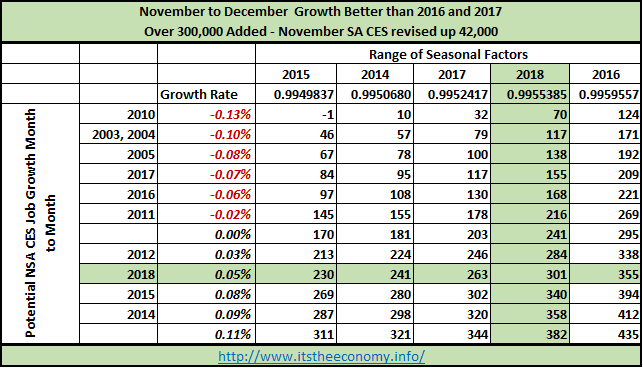 If we had “zero” non-seasonally adjusted growth and if we used the December 2017 seasonal factor we would still add 234,000 seasonally adjusted workers. The seasonally adjusted worker data was expected to improve month to month for all sectors except Information Technology (IT) and the Trade, Transportation, and Utility (TTU) sectors. The December to December data was anticipated to show gains in all sectors except IT. Unemployment, seasonally adjusted and non-seasonally adjusted, were expected to fall. Even with the drop negatively impacting the participation level, the non-seasonally adjusted workforce participation rate was expected to be better than December 2017. Multiple job workers was expected to rise, especially those working two part-time jobs. What was recorded, non-seasonally adjusted, and what was reported this December? The headline Jobs Number was 312,000. This is different from the ADP payroll number because the Non-farm payroll (NFP) number includes government workers while the ADP payroll data is a private sector tally. The Total Private Sector data was 301,00. This is important because this is the data that was used for former President Obama’s “Jobs Streak.” There were some people who were considering a number over 200,000 to be optimistic. We could have seen the number reported even higher if they used the seasonal factor from 2016. This does not include the upward revisions to the November seasonally adjusted private sector CES data of 42,000 workers from 127.515 million to 127.557 million workers. All Sectors except Information Technology grew December to December. The largest gains were in Trade, Transportation, and Utilities (TTU) and Manufacturing. Month to month the non-seasonally adjusted data was pretty much as expected. We saw a drop in Construction, IT, Professional Business Services (PBS) Other Services, and Government. The non-seasonally adjusted worker data dropped, as expected, not as much as 2016 or 2017. 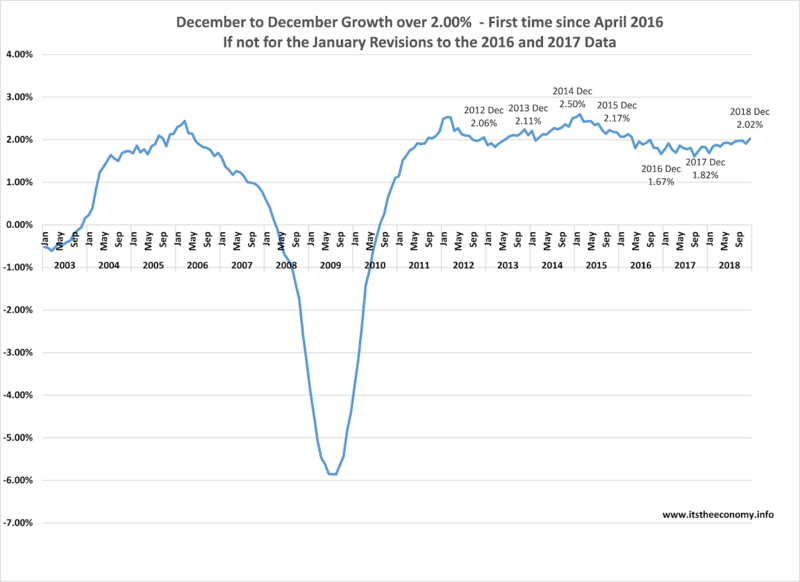 The data tends to fall during December and January. We saw a similar pattern between 1979 and 1996 and 2010 to date. The seasonally adjusted jobs data saw increases in both full-time and part-time jobs. There were major revisions to the CPS jobs and unemployment data, going back to January 2011. There will be more written on this topic next week. Unemployment rose, and that is okay. There was an increase in the non-seasonally adjusted and seasonally adjusted U-3 unemployment levels. The increase in seasonally adjusted jobs and the increase in seasonally adjusted unemployment bolstered the seasonally adjusted workforce participation rate. There is a considerable amount of data to dissect. The wage growth was phenomenal, more than what is being reported elsewhere. This will be detailed in the “Wages and Workers” article. The number of people working two part-time jobs popped to 2.081 million. Women are working more dual part-time jobs than men. Men are working more dual full-time jobs than women. There will be more detail in the “War on (Wo)Men” article. What happened to workers by age group? That is another article. The data was solid. It did not come to a surprise to anyone who read this column’s forecast article.